The loss of permanent teeth can be a traumatizing experience for anyone at any age. Everyday tasks such as eating and speaking may become uncomfortable and embarrassing, and self-esteem can be impacted, leading to stifled laughter and hidden smiles. Dental implants offer those facing impending extractions or distressing over missing teeth a beautiful, permanent, and natural-looking solution for restoring their smiles. Though these basic benefits are obvious, there are several lesser-known facts about dental implants that might just help you make a decision about restoration solutions if you are still on the fence. Dental implants are often thought of as new technology; however, they became available in the 1980s and have been widely used ever since. The implant procedure has a 95% success rate, which is the highest of any tooth-replacement option. Though dental implants have a higher up-front cost, they are less expensive than other restoration options over the long run. Dentures and bridges need to be replaced regularly, requiring additional expense, and they can damage adjacent teeth, resulting in the need for additional dental work. Dental implants last a lifetime and preserve the health of the surrounding teeth, resulting in reduced overall dental cost and discomfort. 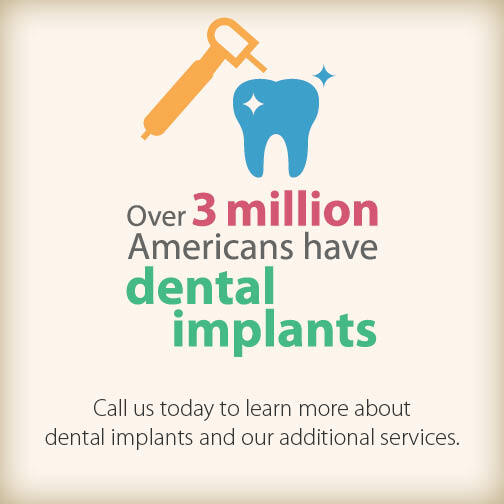 The implant procedure typically only requires local anesthetic to keep patients comfortable. Furthermore, though providers will write prescriptions for post-op pain meds, the majority of patients find over-the-counter medications, like Tylenol and Advil, sufficient for managing their pain. Though it takes anywhere from six to 16 weeks for the bone to heal around an implant post, the vast majority of this time is pain free. Patients can also be fitted with a natural-looking, temporary tooth while they wait to receive their permanent restoration. Of all the restoration options, dental implants are the easiest to care for, requiring the same oral-hygiene practices as natural teeth. Call North Babcock Dental Care in San Antonio at 210-691-1200 to find out more about dental implants and whether they are the right restoration option for your dental needs. Previous: Previous post: What is a deep Cleaning? Next: Next post: How good glucose control can prevent mouth problems!